Q – Is there a host hotel? A – The packet pick‐up, 100 mile participant weigh‐in, and drop bag drop off point takes place at the State of Nevada Legislative Grounds, just south of the Nevada State Capital. The street address for the Nevada State Capitol is 101 North Carson Street. The best place to park is one block west in the public parking area on Curry Street and 3rd Street. 100‐Milers: PLEASE make every attempt to complete your mandatory weigh-in by no later than 3:00 pm so you’ll be able to make the briefing in time, which begins at 3:30 pm. Q – Where should I leave my drop bags? A – Drop bags are allowed at Hobart, Tunnel Creek, Diamond Peak and Stonehenge for 50M and 100M runners only. 100 Mile Runner Drop Bags are due at the drop off point at Packet Pick-up no later than 3:00 pm on Friday. 50 Mile Runner Drop Bags for Hobart Aid Station are due at the drop off point at Packet Pick-up no later than 3:00 pm on Friday. Tunnel Creek and Diamond Peak Drop Bags may be dropped off on Friday at Packet Pick-up or Saturday morning, although it is recommended that they be dropped off on Friday. All Finish Line drop bags should be taken to the finish line area on race morning. No drop bag service for 55K: 55K runners wishing to have drop bags available during the event will need to make their own arrangements. A – 50‐Mile runners can drop their bags by 3 pm on Friday with the 100‐mile bags or by no later than 6am on race morning. In order to help assure your drop bag will be waiting for you at scheduled aid stations it is strongly recommended to drop them off on Friday. Saturday morning drop off service will only be available to Tunnel Creek and Diamond Peak aid stations. There is no drop bag service for 55K runners! A – Please be aware that we CANNOT guarantee that 50‐mile drop bags will be returned from our aid station until approximately 10am on Sunday from Tunnel Creek and approximately 3 pm on Sunday from Hobart. This is the worst case scenario. We will make every reasonable effort to return them as early as possible but understand our aid stations are in the back country and staff will have limited opportunities to return them as we are required by our permit to limit the amount of back country vehicle travel to essential trips only. If a vehicle leaves an aid station travelling to the start/finish, they will bring as many drop bags as possible if it’s known that those runners have made their final visit to that aid station. Knowing this, please plan and pack drop backs accordingly. Any unclaimed 50M drop bags and all 100‐mile drop bags will be available at the 100 Mile Event awards ceremony on Sunday afternoon at Spooner Lake State Park. Q – What happened to the Bus Tickets? A – Bus tickets are no longer necessary! Due to limited parking at Spooner Lake Nevada State Park, we are transporting all entrants to the start line. Q – Where do I catch the motorcoach and at what time? A – There will be passenger motorcoaches that will pick up runners at Gold Dust West, Wyndham Gardens (acroos the street from The Carson Plaza Hotel) and at the Courtyard Marriott. There will be two pick‐up/departure times. The motorcoaches will arrive at 3:15 am with departure for Spooner Lake State Park at 3:30 am. 100‐MILE RUNNERS HAVE PRIORITY SEATING ON THE FIRST COACHES. If there is space available, 50M and 55K runners may also depart on the first coaches. The coaches will return for their second trip at approximately 4:15 am with departure at 4:30am (or once full, whichever comes first). Please check‐in with the race official before departure. Q – Can I camp at Spooner Lake State Park? Q – Can I camp at Diamond Peak Ski Resort? A – It is highly recommended that you utilize the bus service that takes you from the Plaza Hotel to the start at Spooner State Park. There is shuttle van service to take runners back to the Host Hotels in Carson City following the race. Parking at Spooner State Park is tight and requires payment of the State Park Fee. Crew and family members who park within Spooner State Park will need to pay the parking fee to do so. The dirt lot we previously used for free parking will not be available. Runners, please use the motor coaches and shuttles, and have your crew/family purchase a day pass to park in Spooner Lake State Park. Q – How do I get back to my car after the event? Q – Are trekking poles allowed? A – Yes, trekking poles are allowed, however due to trail congestion, we ask that you refrain from using them until after the first aid station. Q – Can I bring my dog(s)? A – No, there is no organized dinner. Downtown Carson City is blessed with many great restaurants to choose from. A few options are The Fox BrewPub, Gather, The Union, Black Bear Diner, Red’s 395 Grill, The Basil Thai food and Garibaldi’s Italian restaurant. The south end of town has an Olive Garden. The Fandango Casino has an Italian restaurant, Ti Amo, as well as Duke’s Steak House. Enjoy! A – We are pleased to have a partnership with Patagonia for our race shirts. All race participants will receive a Patagonia shirt upon check‐in. We also have a TRTER merchandise booth with a full lineup of clothing – all with our race logo. A‐ Yes. TRTER allows pacers for 50 mile and 100 mile runners. 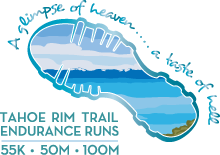 50 Mile runners can pick up their pacer in only one location – the 30‐mile aid station at Diamond Peak. 100‐mile runners can pick up a pacer at the Stonehenge aid station located in at the start/finish area and at mile 80 Diamond Peak aid station. Pacers should be as self-sufficient as possible and carry their own food, as they do not pay an entry fee. Sign-in and waiver signatures will be required at both locations. Q – Aid Station food? A – We at TRTER are very proud to support you with some of the best aid stations in any ultra in the country. Each aid station has their own theme and we leave it up to them to come up with their unique food items. During the daytime hours you will find pretty standard aid station fair such as PB&J’s and boiled potatoes and snacks. You may even find an Ensure smoothie if you ask nicely. At night the 50 mile and 100 mile runners are treated to a plethora of hot food. I will make sure that each aid station has a vegan option for hot food. A ‐ We highly recommend The Tunnel Creek Café. It’s in Incline Village right on the way from Spooner to Diamond Peak. Good people run it and they have a very nice menu.